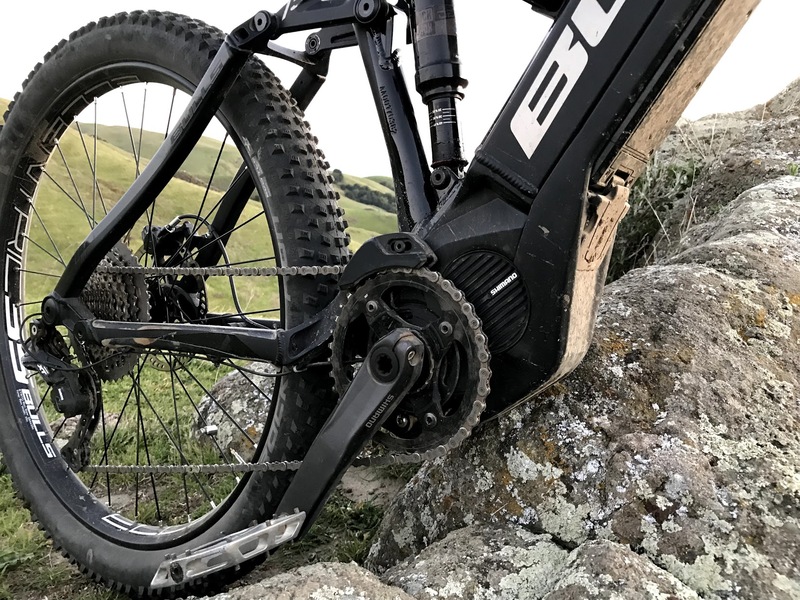 Featuring the Shimano E-8000 motor and the Di2 drivetrain, the E-Core is an e-bike with 150mm of front and rear travel from Germany’s Bulls Bikes. It uses Shimano’s internal battery which is a massively reinforced system that pushes the weight of the bike to 53 lbs. Capacity is 500 Wh so the range is good for about 3000 feet of climbing if the rider helps out a little or 4000 is if the rider puts in a lot of sweat equity. With the internal battery, a small-sized water bottle is handled easily by a medium frame. Plus tires are used 2.9 Schwalbe Nobby Nics. 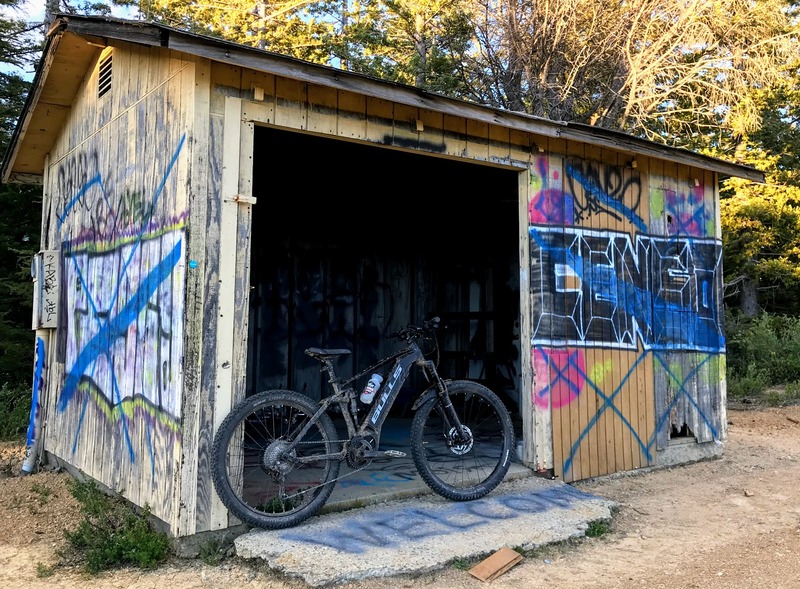 We’ve been riding ebikes off and on for the last seven years and it is the biggest growth area of the industry as we see more of them each week. It’s a way to bring new riders into the sport and opens up new options for existing mountain bikers. 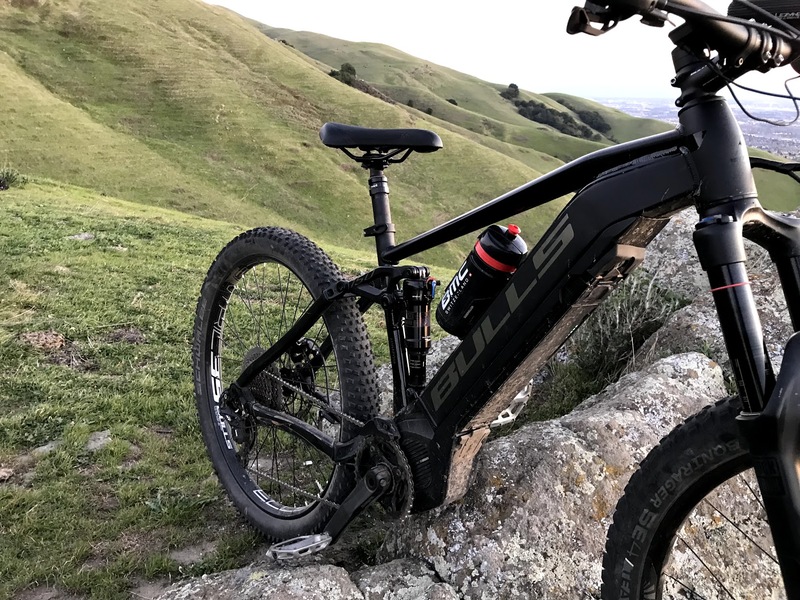 The Bulls Bike E-Stream is a Class 1 category ebike with 250 watts of pedal assist power. 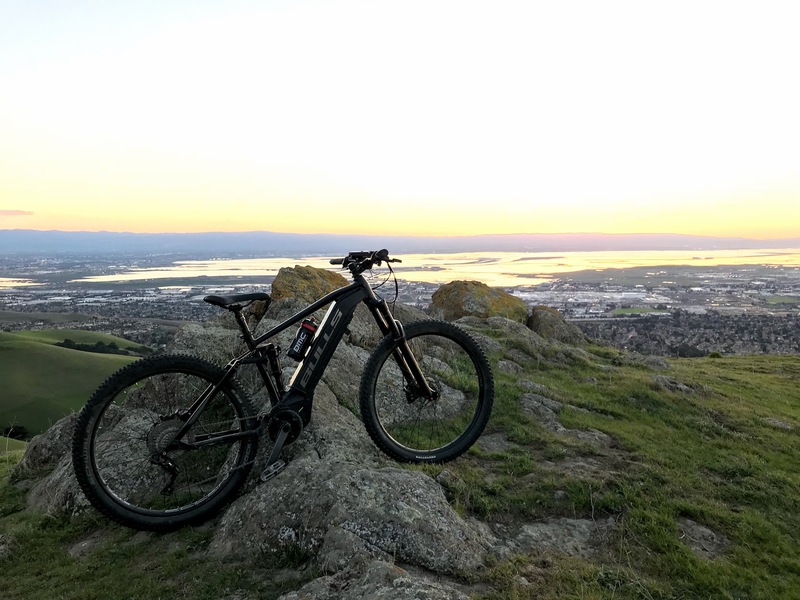 Three of our local trail networks were legalized to eBikes this year and we’re happy to report that not much happened in terms of conflict. Riders and other users seem to be getting along normally with more participation from new cyclists. The conflict is more on the biker vs biker side as the sport is in a state of change and some cyclists exhibit hate on eBikers. Though not an easy change, our audience has shifted from 90% disapproving of eBikes to about 40% today. But much work needs to be done in terms of educating trail managers and ironing out where they are legal and where they are not. Though this is not a 5-star descending or handling bike, we applaud Bulls Bike’s efforts because they are motor and drivetrain agnostic. While Trek is tied to Bosch systems, Specialized to Brose, etc., Bulls Bike will use any motor from any company if it suits their need. And that is a brilliant strategy indeed since there is an arms race between motor system suppliers and great advances will happen in this arena over the next five years. We expect motors, software, apps, batteries, and integration to improve significantly and these companies will leapfrog each other every iteration. 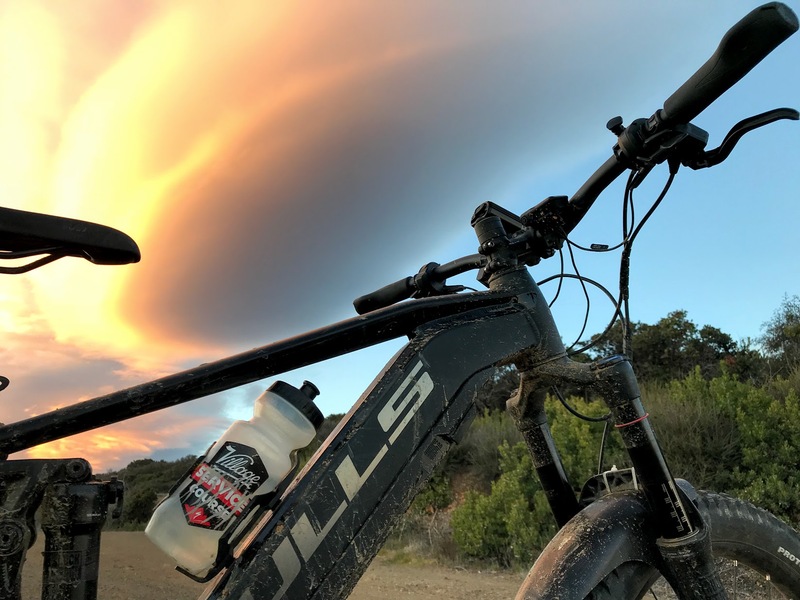 The Bulls Bike customer can benefit from this advancement and choose the bike and the motor system that best suits them. Grand vistas were the norm even on short rides. The great benefit of the Shimano system is the low-end torque and sensitivity. With this system, a rider can climb the steepest hills slow or fast. Choose an assist mode, get comfortable and spin. Spec sheet might say just 75 nm but it is very, very usable. In trail and eco mode, the power comes on very smoothly and the riding is very natural indeed. It just feels like you’re having a good day or perhaps ‘the best climbing day’ on the higher assist modes. The other advantage of the Shimano system is it uses a big, normal sized chainring. This enables suspension compatibility with minimal interference and it delivers a smoother power delivery. When the assist shuts off at 20 mph, the motor disengages and the drivetrain delivers minimal drag. Thus on a descent, the rider can pedal past 30mph and beyond. It may seem obvious but it’s very difficult on some other systems. We rode this bike on many exploration rides into the night. The integrated power unit battery is fully hidden inside the downtube, allowing for a clean front triangle and water bottle space. 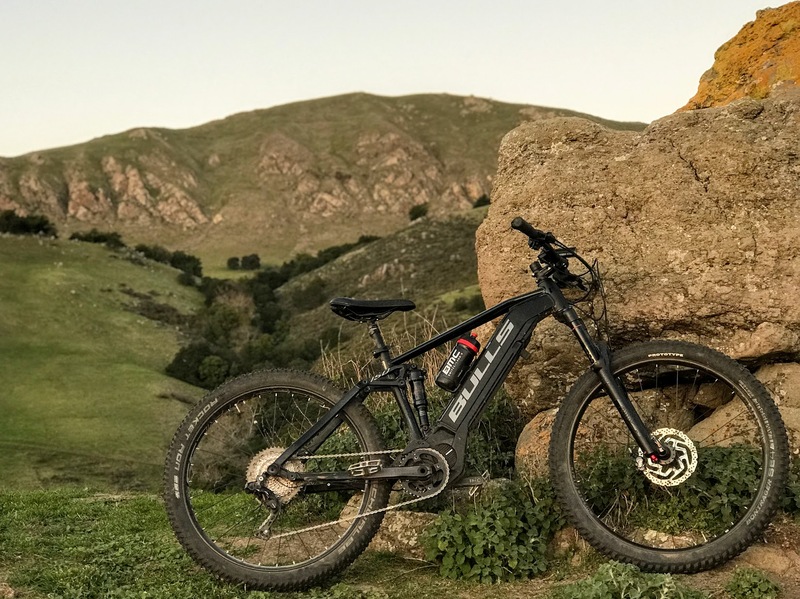 The 500 wh unit lasts approximately 30-40 miles on the trail and is good for climbing 3-4000 feet depending on how much the rider wants to exert. We think the Shimano motor is one of the best and most usable systems today. But it has its quirks. With the Di2, the system will not shift unless the motor is turned on. And the motor keeps turning off after 5 minutes of idle time. To turn it on, one has to reach under the battery and press a switch. During this time, one cannot touch the pedals at all since it’s calibrating the torque sensors. Thus it becomes a very awkward routine of jumping on the bike, discovering the motor is off and stopping to turn it back on. Another issue is the motor mode selector is the old ‘front shifter’ of the drivetrain. Though ergonomic, it occupies a lot of space and pushes the dropper lever away, to the top of the handlebar. 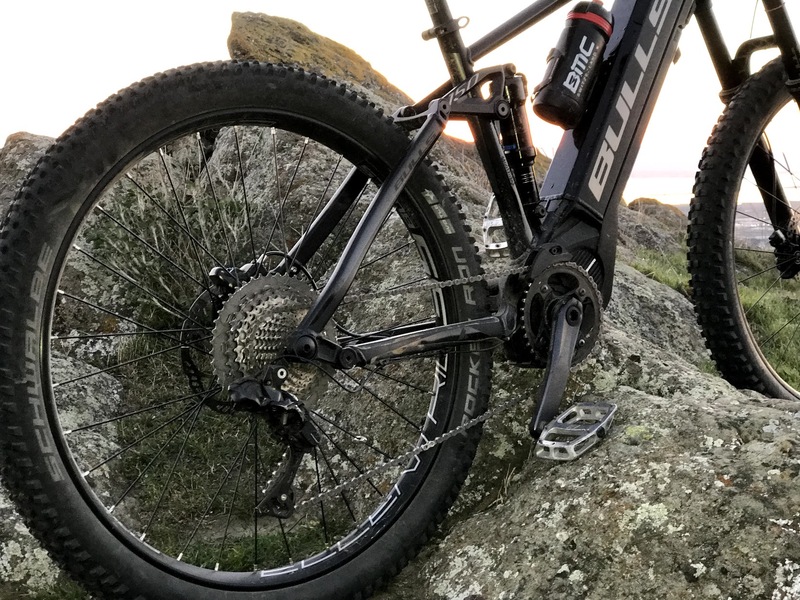 Given that we use the dropper lever far more than the motor mode selector, we’d rather have the dropper lever under the bar where we don’t have to unwrap our thumb and compromise bike control. 2500 foot climbs became part of our daily after work routine. The Shimano display is nice and tiny and centrally located by the stem. We only wish that the system can be turned on right there. Instead, the rider has to feel around under the battery and press a discrete button. The battery indicator is a 5-bar display and that is very limited system. With two bars left for example, the rider cannot tell if the system as 21% or 40% battery charge left. More resolution would have been very useful here. Head angle is 68 degrees and seat angle is ok at 74 degrees. Chainstays are fairly long at 460 and reach is long enough for a medium at 453. It got us through many, many big descents in our local area safely and with a smile, especially after we replaced the front Nobby Nic with a big Maxxis Minion. We’re calling attention to this because it’s a big deal these days, but rarely found on ebikes. To make this possible, the battery is mounted inside the downtube and the suspension bits are out of the way so it can fit a large water bottle. With assisted power, one bottle is enough for most two-hour adventures. 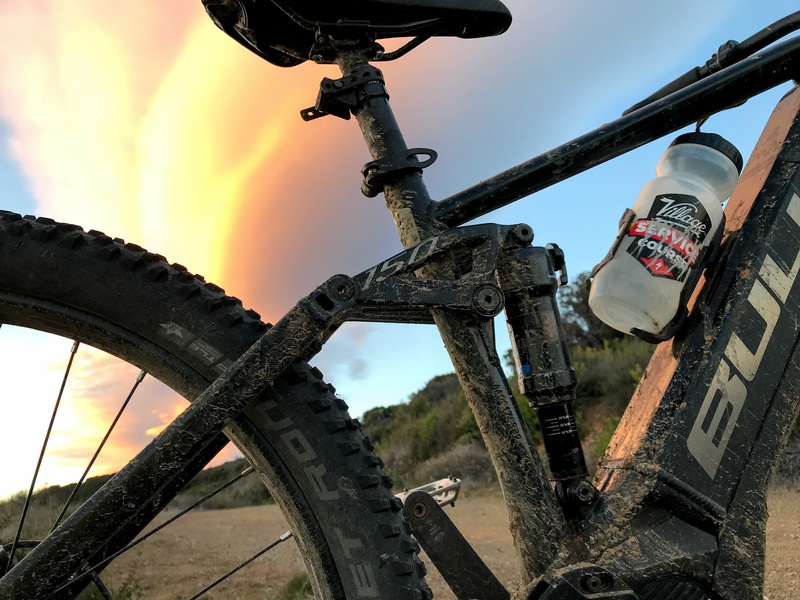 Carry another bottle or a pack, and you could conceivably ride for 4-5 hours. Adam from Bulls Bikes, talks about some of their other bikes in this video. We’re particularly interested in the E-Core bike with two internal batteries of 350 wh each. One or two can be used optimizing for range or for weight. 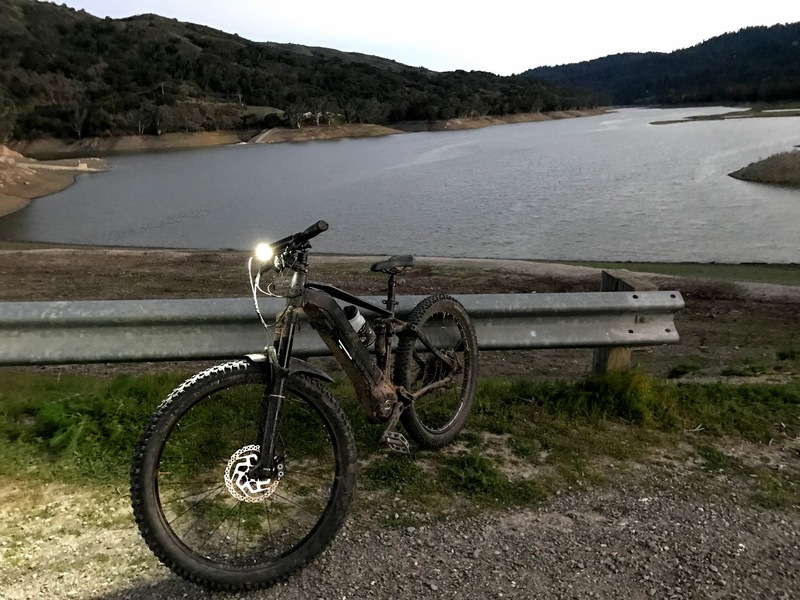 This is incredibly useful since weight is an issue and rides can be quick after-work jaunts or long weekend exploration rides. It’s a solid bike with good value for a Di2 drivetrain with Shimano motor, both some of the best-in-class right now. Suspension and geometry and weight are not ideal but we are fascinated with all the motor and systems options Bulls offers in their line. Yes, it made it to that peak no problem. Please start a separate review site for e-bikes. Thanks. 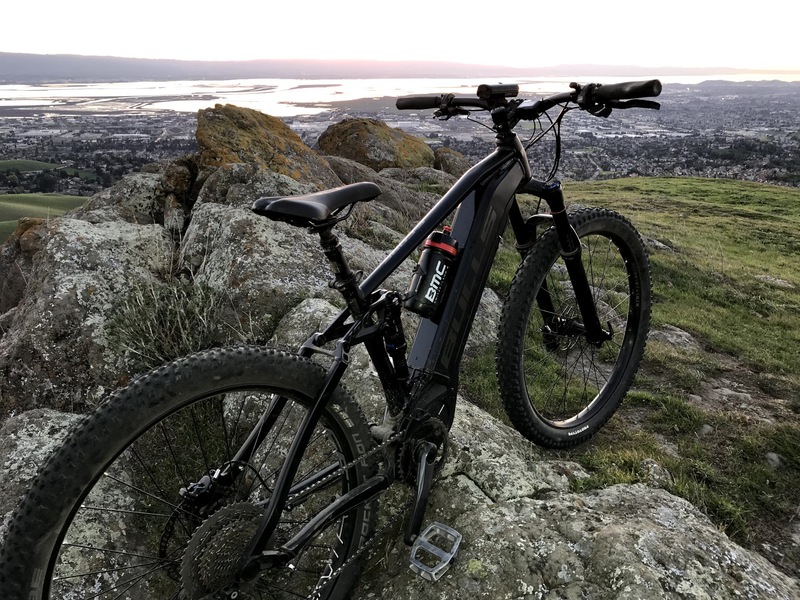 I really appreciate the integrated bike/e-bike review site. Thanks. 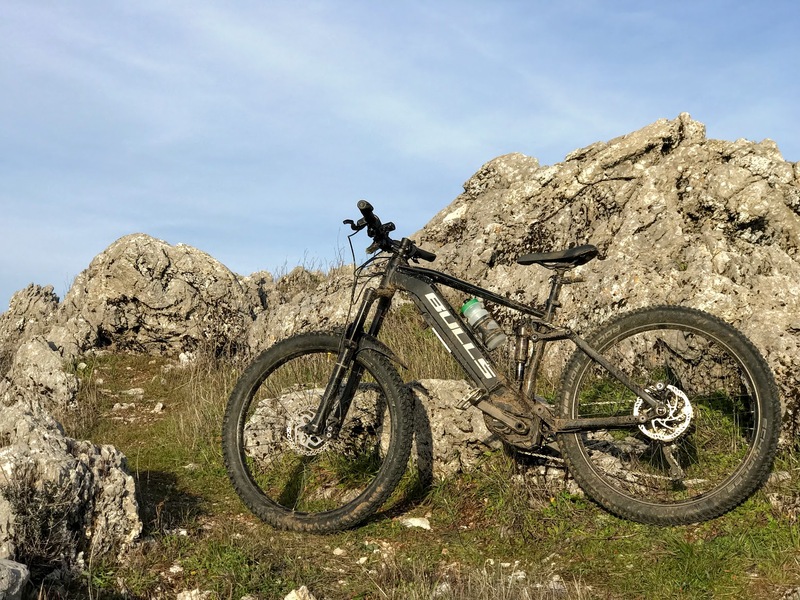 Where ebikes can ride or not? I’m sorry, ebike riders are able to ride anywhere they want. I agree. I ride both Es and Standard MTB. They all serve a purpose. So Cal I can ride many trails. I guess they have to catch me first if someone has an issue with Es.